Interesting. In this time when they have handed out umpteen death and life sentences out to various people of the Mumbai bombings, I was reminded of the Gujarat pogrom. 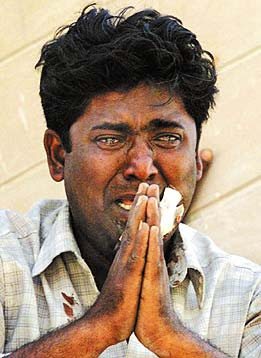 A systematic, well-planned massacre that took place in Gujarat some years back. I don't think anyone has been convicted. Hmm, some even have offices of position these days. Aah, the irony. Incidentally, that picture is of Qutubuddin Ansari, a tailor who was pleading with the mob at the time this picture was taken. He is now living in West Bengal at the behest of the government there.